You will see that becoming a loyal customer is the only way to go! Why? Our loyal customers enjoy our amazing distributor pricing and you can change your order each month so you can try out different products and make sure that you stay stocked up. Not only do you get amazing wholesale pricing, but you get FREE shipping in the USA on any order that is over $125. You also get amazing perk points and online access to manage your account. 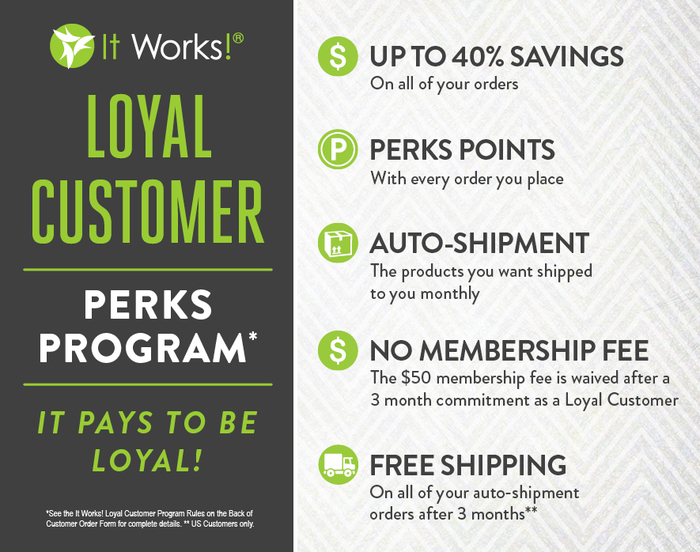 What exactly is an It Works loyal customer? When you sign up as a loyal customer for our body wraps, or any other of our products, you enter in to a community that is ready to help you succeed. You will have access and accountability from my team and from me. Setting you up for success is our goal for you as a loyal customer. As a loyal customer, you are agreeing to make a purchase for 3 months through an auto-ship program. Why 3 months? It may take up to 3 months to see a noticeable difference and because we want you to succeed and because of the significant discount you’re getting, we want to make sure that you are seeing the results that you want. Of course, you can change your order at any time. You are not required to order the same product each month, you can mix and match and try new products to see how great they would be for you. However, if you do not edit your order, the same items from last month’s order will be shipped to you on the date you signed up each month. Now that you’re a loyal customer, you will be issued a username (ID number) and password so you can log in to the website and track and/or edit your orders. You will also receive Perks Points! You can redeem your Perks Points (product credit) at any time. Once your 3 month obligation is done, you will ALWAYS be able to order at the wholesale pricing and you won’t have any monthly commitments anymore! Plus, after your fourth month of auto shipments, shipping is FREE for our US customers! Once you have completed your 3 month commitment, and would like to cancel you must login to your account to stop your autoship or you can do this by calling customer service. Which Body Wrap Kit Should I Start With? We have 3 different kits that could work for you. Our Wrap Pack is perfect if you’re just looking to tighten and tone. The Wrap Pack comes with a box of 4 body applicators and a sample size defining gel. The defining gel is an excellent pairing to our applicator and helps improve results. Our Skinny Pack is perfect if you want that extra oomph with taking care of your body. This Pack includes 4 Ultimate Body Applicators, 1 full size bottle of Defining Gel and a bottle of our Advanced Formula Fat Fighter with Carb Inhibitor tablets. These tablets are perfect for if you have a day of naughtiness with your food. All you need to do is take it 15 minutes to an hour after you have eaten and these amazing tablets will absorb some of the fat and carbohydrates from your food so that your body doesn’t. This is by far our most popular Pack because of the results it can provide you. Our It Pack will give you the “it” body you’ve been wanting with the best of our Skin, Body, and Greens™ with the IT Pack! Soothe, smooth, and lift with Lip & Eye and Facial™ while you alkalize and energize with Greens on the Go™. Wrap it all together with the Ultimate Body Applicator™ and Defining Gel™. These 3 packs are a great starting point for you to get started with your health and creating success for your body. You will not be disappointed when you sign up and order one of our packs today! The biggest failure is the lack of getting started. Start now, start today and let me help you create the success that you need. Accountability, community and actions is what it takes and we are excited to help you with all 3! Enrolling as a loyal customer is super simple. Simply start shopping and during checkout you can select to either be a retail customer or a loyal customer. *No minimum price or quantity restrictions per order. You simply must have at least one product in your monthly auto-ship order for three consecutive months. If you cancel your Loyal Customer membership prior to fulfilling the three-month auto-ship minimum, you will be charged a one-time $50 (USD) Membership fee.